Many of us might wonder what the apocalypse might be like some day in the near future but we might not always get the chance to experience what it’s like. While many places go abandoned because their toxic, they’re not the best places to explore since they could be harmful to your health. Other apocalyptic areas are becoming tourist attractions and can be very unique places to check out. From a sunken prison in estonia, to churches decorated with bones, here are the most apocalyptic places you should visit! Ever wonder what an abandoned nuclear wasteland might look like? Here’s the place to come! You might get the chance some day to be able to visit the chernobyl exclusion zone if you’re able to pay off the right people. More recently, it’s been open to tourists but only for a short period of time so you don’t get radiation posioning. The Duga Radar installation in the Chernobyl Exclusion Zone is an abandoned Soviet military project that is just completely massive. This was constructed in order to detect enemy aircraft missiles or other objects before they were able to fly into to Russia. The radio waves this thing was able to give off would lead to mysterious noises being heard on shortwave radios. The abandoned city of pripyat however absolutely must make this list and there’s no way around it. Just be careful of the radioactive bears while you’re exploring the wreckage. As mental health was beginning to become more researched in the 1800’s, more and more mental hospitals were being opened up in Great Britain and around the world. In 1896, the hospital opened up with 540 beds which was about the right size. But as time went by, it became a tuberculosis sanitarium as this outbreak was striking more fear into the population. It continued to function as on up until for roughly 50 years, and it nearly doubled in size in 1904. Eventually once tuberculosis became less common, it just functioned as a hospital up until 1996 when it finally closed it’s doors. It’s been a popular place for urban explorers to check out and get spooked out by any little noise. Many claim it’s quite haunted and just by looking at it, it seems to give off some spooky vibes. 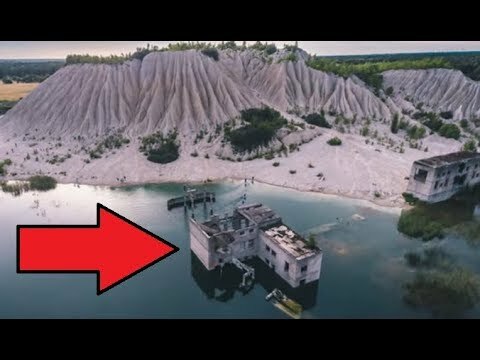 This abandoned prison, located in the country of Estonia, was once considered to be Europe’s Alcatraz and certainly not a place you’d willingly go to .A quarry was formed to gather marble in the 1930’s but it quickly became a prisoner camp where subjects would be forced into a life of slave labor. Near the quarry are two prisons which the most visited one being, Rummu Prison. Groundwater began to rise here and it submerged the prison, but surrounded it by crystal clear water and white sands. This flooded prison which was once home to much human suffering has also become a dark tourist attraction for thrill seeking scuba divers. Built from limestone, this housed an estimated 7,000 convicts between 1930-1931 and many were forced into hard labor for nearly 12 hours a day. There might not look like much from outside, but there’s seemingly an endless amount of things to explore underwater. In present times, local estonians enjoy having picnics in the area. Soviet prisons in estonia were like a little slice of the apocalypse on earth. Who’d want to take a tour of a haunted lunatic asylum from the 1860’s in West Virginia? If the zombie apocalypse broke out during 19th or 20th century, it certainly seems like it could have started here. Not only is it apocalyptic, it’s likely to be one of the most haunted places in the country that you can actually visit.This location once housed thousands of mentally ill people. It’s said to be home to unexplainable voices and sounds that would send chills down your spine. Hundreds have unfortunately died here and it’s believed the souls of the mentally unstable still wander the hallways. It’s been featured on a few ghost television channels such as Ghost Adventures. It might be best just to watch and not go. Ever wonder what a good apocalyptic venue for the olympics might look like? No need to wonder any longer.Sarajevo, the capital city of Bosnia was once awarded the 1984 winter olympics. Looks like nature is taking over in this photo. The bobsled track at one point held 50,000 total people to watch luge and bobsledding spectators. When war struck the area, ==the track was damaged and eventually used to place artillery. The track is still there to this day, but is covered in graffiti. Now that the war is over, people enjoy using this area for bicycling.